Your home’s style provides visual cues that you should listen to. Do not, however, be completely bound by these cues when selecting siding colors. Colonial homes are often painted a single color such as white. Yet, unusual accents can offer a subtle, but modern twist to that tradition. Cottage and country styles offer more freedom in choosing siding colors. Home exterior remodeling companies like Triangle Home Exteriors can suggest what matches your architecture. A particular siding color has a certain look on bright sunny days. This may be quite different on a snow-packed winter afternoon. The intense sunlight during summertime’s peak makes colors feels brighter. Always consider the climate in your area. A dark color may look rich and distinctive. But when painted on the facade of a mid- to large-scale house, it can feel gloomy and overpowering. Colors that are too light may prevent a smaller home from standing out in its landscape. Lighter colors neutralize features that you wish to play down while darker colors draw attention to places you want to emphasize. Expert siding contractors will know what matches the size of your house. Siding colors have a variable life span, but a roof, in general, will last from 20 to 30 years. As a result, roof color should be always considered when choosing siding colors. If your roofing material is dark, consider a lighter siding color. Whereas, a more neutral roof hue may allow more choices. Consult your contractor for the right match. With a dependable siding and roof replacement expert, you can’t go wrong. 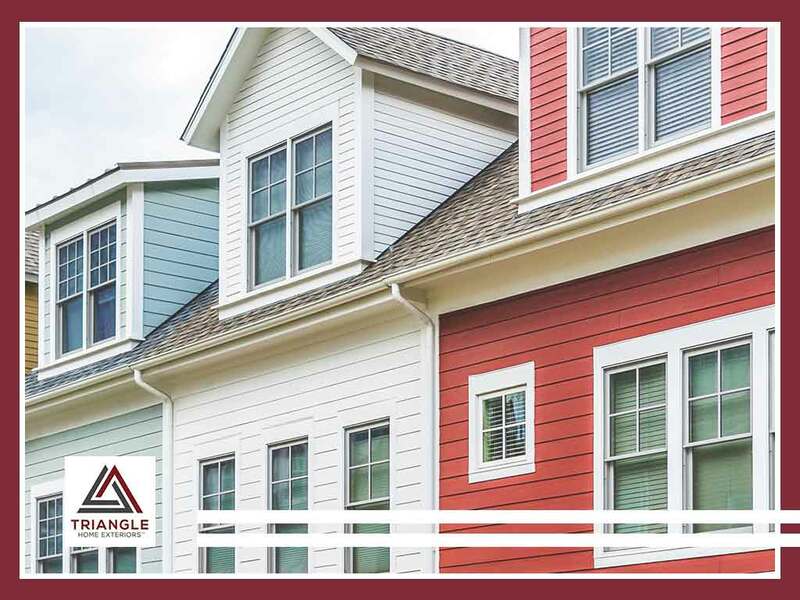 Let Triangle Home Exteriors help you with pristine siding colors that match the rest of your home. We serve homeowners in Raleigh, NC, and other nearby areas. Call (919) 436-3200 for your no-obligation consultation.